The popularity of the Space Patrol TV show through the first half of the Fabulous Fifties had a profound influence on those who saw replica rockets as a powerful marketing tool. Such was the case with The Ralston Rocket, actually a pair of similar roadgoing rockets (with different dorsal fins) designed to be towed to and from public events, store openings and other such gatherings. Though the fate of one of the Ralston Rockets is unknown, the other is well documented. As Space Patrol was nearing the end of its televised run, Ralston decided to end their promotional campaign with a bang by giving away the rocket in a contest! The winner of the “Name the Planet” Contest was Ricky Walker, who enjoyed having the 35ft long, five ton rolling rocket delivered to his home. Evidently Walker’s parents were less than thrilled as they sold the rocket for $1,000 to a traveling carnival. The Ralston Rocket was last seen in Gent, NY, in front of a construction company (as shown above)… neglected and rusty, the rocket was broken up for scrap in 1985 several months after the photos above were taken. Chagrined kids who envied Ricky Walker’s luck back in 1953 would have another shot at spaceship-owning nirvana just 6 years later when Kraft Foods began running ads on the backs of comic books. Send in an entry to Kraft’s “Name The Spaceship” contest along with an empty bag of Kraft Jet-Puffed Marshmallows and you’d be eligible to win the grand prize: the Kraft Aerojet Training Space Ship, built by Aerojet General with seats for 4! The winner was a girl from St. Louis, MO, who later donated it to a local school. From there it found its way to the front lawn of an area rehab center where sometime in 1975 or 1976, the center’s administrator paid a contractor to crush and bury the ship. 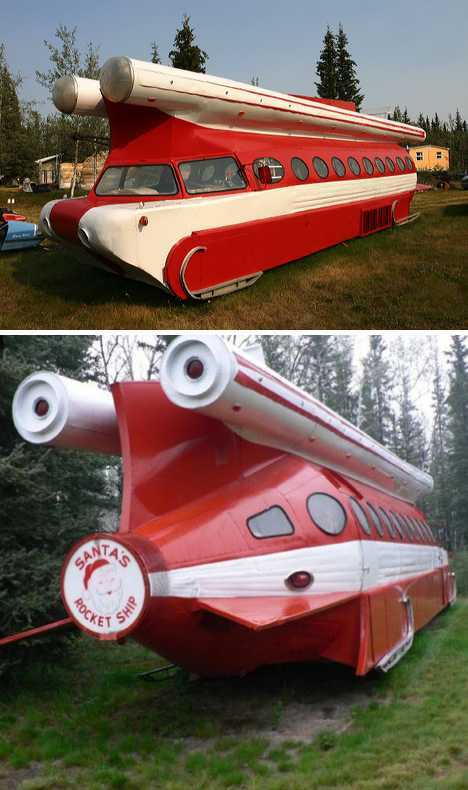 Santa’s Rocket Ship was the brainstorm of Lloyd Laster, a Tyler, TX promoter who operated a five-vehicle fleet of Christmas-themed bus conversions from the mid-1950s to his retirement in 1974. 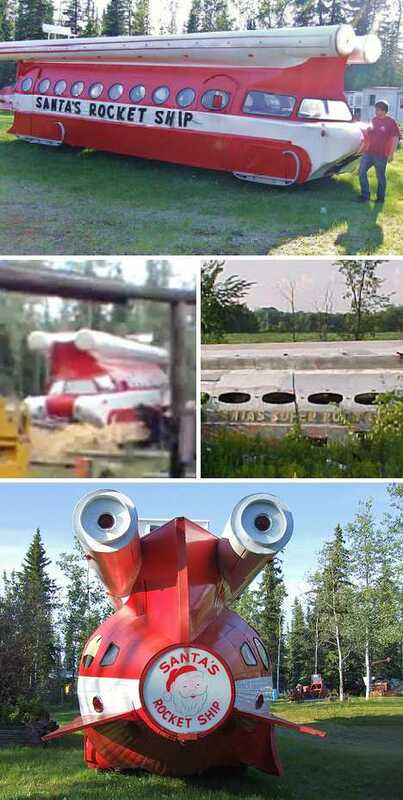 After Laster liquidated his fleet, the quintet of sleek red & white “Christmissles” met a variety of fates… some continued to ply the promotional circuit for a time but at least two ended up in a Wisconsin scrapyard. The single remaining Santa’s Rocket Ship traveled the furthest, all the way to Alaska as it happens! Credit that old holiday magic if you like but save some praise for the operators of Mukluk Land, a former junkyard reborn as a roadside attraction/arcade in Tok, Alaska. Considering the location, Rudolph and the boys should petition Santa to ban the restored rocketship from joining in any reindeer games.